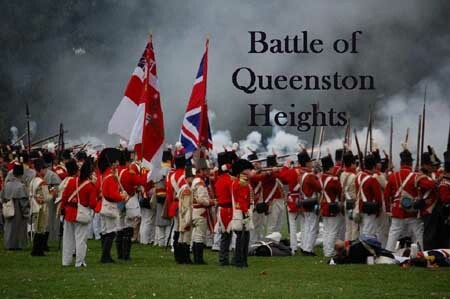 Exactly 200 years ago , October 13, the 41st Regiment and the 49th Regiment, supported by our Native Allies and local militias fought the Americans at the Battle of Queenston Heights. It was a start and turning point for Canada. It was at this battle that Sir Isaac Brock was fatally shot. On Friday the 12th some members helped with the site’s Education Day. On Saturday many made the 12 km march from Fort George to the Heights and then participated in what must have been the largest recreated War of 1812 battle in Canada. It is rumored that there were more re-enactors present in 2012 than actual soldiers in 1812!